The Managing Directors of KPMG in Bermuda announced that this year’s KPMG Scholarship has been awarded to Jahlae Outerbridge, a 2012 graduate of Cedar ridge Academy who is pursuing a Bachelor’s Degree in Accounting at Georgia State University and aims to obtain her Certified Public Accounting designation upon completion of University. The KPMG Scholarship is awarded annually by the Managing Directors of KPMG in Bermuda and is given to a Bermudian student committed to a career as a Chartered Professional Accountant – [C.P.A. Canada] or Certified Public Accountant – [C.P.A. [U.S.]. The scholarship provides financial assistance for undergraduates and postgraduates, an invitation to a career and a future full of possibilities. The KPMG Scholarship has a value of BD$20,000 per annum and is renewable for a total of three years, providing the recipient meets all of the required conditions. Recipients are placed in the firm’s mentor-driven graduate programme and ensured that every professional step taken is well-planned, supported and coupled with a personalised development plan tailored to meet the individual needs of each graduate. From left to right: Wanda Armstrong, Senior Manager, HR; Jahlae Outerbridge, Scholarship Winner; Steve Woodward, Managing Director, KPMG Enterprise; and Jennifer Beech, Manager, KPMG Enterprise. Steve Woodward, Managing Director, KPMG in Bermuda said, “The Managing Directors of KPMG in Bermuda are proud to award this year’s scholarship to Jahlae Outerbridge. She has shown her commitment to her academics and her future career goals. “Jahlae has a keen interest in accounting and a passion for volunteering and supporting communities. She believes that it is imperative to be active in community activities and she strives to continue to volunteer and give back to the community. 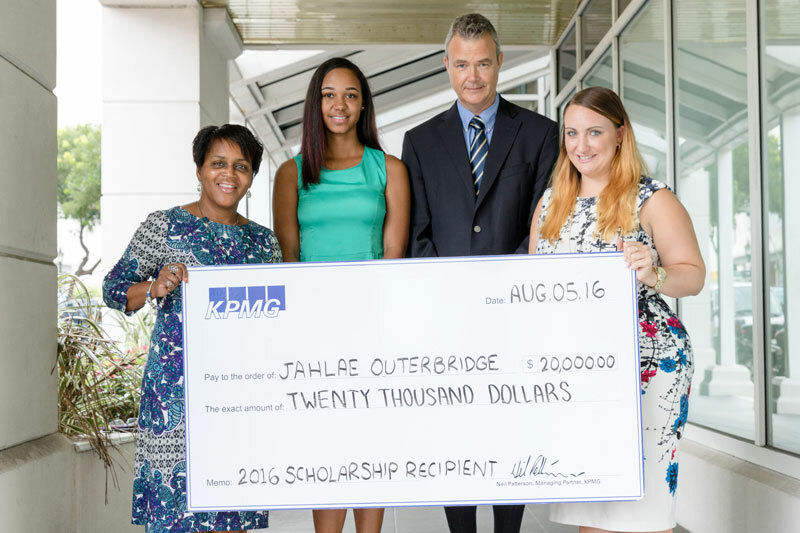 Jahlae commented, “I am truly honoured and thankful to be the recipient of the 2016 KPMG Scholarship. When Ms. Armstrong announced that I had received the award, I was genuinely surprised and immediately started to cry. “To me, receiving the KPMG Scholarship symbolises what one can achieve with hard work and determination. During my first year at Georgia State University, I really put every effort into maintaining a high level of academic achievement, and it is an honour to be recognised by KPMG for my academic performance. “This scholarship will alleviate the financial burden of attending university and allow me to concentrate on my academic goals of obtaining my Bachelor of Business Administration and Certified Public Accounting designation. To find out more about the KPMG Scholarship visit kpmg.bm and click “Careers”. Great job KPMG I love seeing this type of support in the community to assist young people academically. Well done Jahlae, dedication and hard work pay off . Congratulations and I wish you all the best as you continue to pursue your dream .